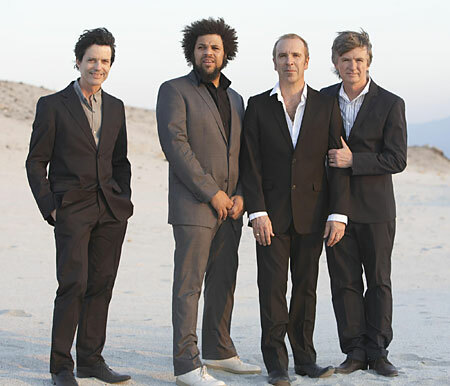 We Wear Suits at the Beach: Mark Hart, Matt Sherrod, Nick Seymour, and Neil Finn. Crowded House were the headliner and the conditions at the 9:30 Club Friday night, and the group deserves nothing less. Reconvened last year after splitting up at the peak of their powers in 1996, they’ve got everything you could want in a band: An embarrassment of superb material, a charismatic frontman, a set list that’s rewritten nightly, a tolerance for — nay, encouragement of — spontaneity, and (most importantly) that palpable love of performing that can’t be faked. Led by Neil Finn (rightly revered as a songwriter of Lennonesque lyrical gifts and McCartneyesqe melodic gifts; seriously underrated as a singer and guitarist), Crowded House overcome every obstacle with grace, from the devastating (the 2005 suicide of ex- drummer Paul Hester) to the merely annoying (the impudence of some of their own alleged fans, who welcomed the band to their first DC gig in more than a decade by yapping throughout the 130-minute concert). The 23-song set was characteristically generous and unpredictable. Five new tunes (“Isolation” and “Twice If You’re Lucky” were introduced by name) suggested a more upbeat direction after last year’s mournful Time on Earth album. Largely inspired by Hester’s death, it was ignored save for “English Trees,” a number every bit as exciting as it sounds. They can’t all be Finn-tastic, apparently. The lengthy second encore brought an improvised composition, and a rarity (“Mansion in the Slums”) Finn declared they hadn’t played in “at least 20 years.” But naturally, the emphasis was on the group’s 1986-96 back catalogue, as fine as any from that era. “Locked Out” rocked out, “Don’t Dream It’s Over” had everyone clutching their better half a little tighter, and for the buoyant “Weather With You,” Finn actually divided the audience and got us to sing two-part harmony. Leave it to this ever-affable Kiwi to bring order to a roomful of surly Yanks. A slightly different version of this review is published in today’s Paper of Record. This entry was posted in 9:30 Club, Crowded House, music, Neil Finn, shameless self-promotion, The Washington Post. Bookmark the permalink. If I remember correctly, Neil introduced song #7 as “7 8 9″… it was a GREAT show.